We are sorry to let you know that Barbara Piner, Kalyani, left her body peacefully and solemnly, surrounded by love and family at 5:20 pm on Saturday, August 4, 2018. Barbara’s devotion and love for India and its people was her special joy. 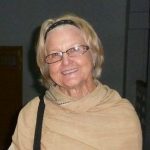 She was a founding member of American Service to India (ASTI) (founded in 1981), and was its President for many years. She served ASTI energetically and faithfully for decades, most recently, and up until her passing, as Vice President. Barbara’s aim in life was to do well to others. A dedicated outreach worker, she tirelessly served the needy, the sick and the unfortunate. 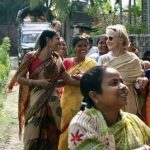 She certainly did that via ASTI with its educational, medical, and disaster relief focus. 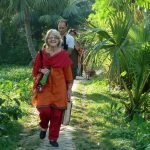 She embodied and was the public face of ASTI, as exemplified by her more than 25 annual visits to India to monitor the activity and progress of the many places ASTI supported. Barbara chose a career in education to be of service to young people. She taught middle school literature and social studies for thirty years, and shone as a pragmatic and robust role model of guidance and compassion for those youngsters who were fortunate to be her students. Barbara demonstrated tremendous courage. She completed the Mt. Kailas Circumambulation or Kora, in Tibet, at the age of 70. She found unyielding strength and discipline through her spirituality, all fed through Vedanta and its teachings. An ardent Vedanta devotee, she received initiation from Swami Prabhavananda in 1970, with the Christ mantra, and again in 1986 from Swami Gambhirananda, with the Ramakrishna mantra. Barbara was born January 10, 1931 in Phoenix, Arizona. Her family moved to a family farm in Washington, where they lived until 1938, when they moved to Napa Valley, CA. In 1958 she settled in Orange County, CA where she lived for the remainder of her life. Barbara is survived by her three children, six grandchildren, one great-grandchild, three nephews, and two nieces, who were all blessed to have her as a role model for a life filled with karma yoga and true nurturing. She lived her life fully and courageously in the spirit of Mother Teresa: “Not all of us can do great things. But we can do small Things with Great Love”. Her family asks that in lieu of sending flowers, please make a donation to ASTI.